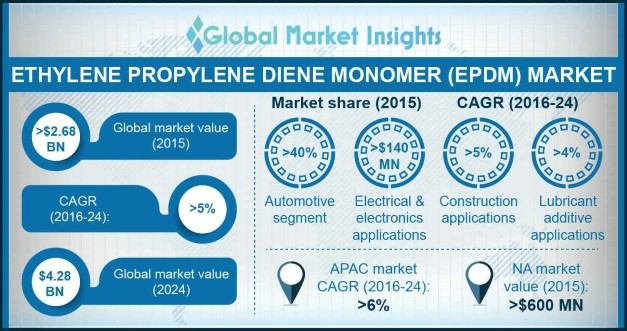 Ethylene Propylene Diene Monomer (EPDM) Market size was valued over USD 2.68 billion in 2015 and is forecast to experience gains exceeding 5% up to 2024. Growing automotive industry, accompanied with increasing range of applications within the domain is anticipated to propel the global EPDM market size growth over the forecast timeframe. Global commercial and personal vehicle production was over 220 billion units & 680 billion units respectively in 2015. Rapid automotive sales in the coming years are anticipated to complement growth. Also, increasing per capita spending results in drifting consumer focus towards functional as well as luxurious cars is another factor likely to propel demand. Plastic plays a vital role in various end user industries. It is one of the major raw materials used in plastic modification application, primarily employed in the polymer modification process for olefinic thermoplastic elastomers such as thermoplastic olefin (TPO) and thermoplastic vulcanizates (TPV). Global TPO market size was more than 950 kilo tons in 2015 and is projected to surpass 1500 kilo tons by 2024. TPVs are polymeric compounds that demonstrate elastomeric properties over a wide temperature range and thermoplastic behavior at the melt temperature. In addition, TPV is used in a wide range of automotive applications primarily due to its excellent UV and ozone resistance, low part weight; and high chemical and weathering resistance. It is employed in under-the-hood applications, tubing, air ducts, suspension bellows, plugs, molded seals, and cable jacketing. TPO is an olefinic elastomer that typically consists of thermoplastic, elastomer, and filler. It is used typically in the range of 5% to 20% in the formulation of TPOs. Increasing polymer application in end user industries such as automotive and construction will positively influence EPDM market size from 2016 to 2024. Construction industry in Asia Pacific, particularly led by China, India, and Japan, is witnessing gains and is likely grow exponentially in the near future. China construction spending was over USD 1.7 trillion in 2015. Increasing polymer use in construction for roofing purposes will drive EPDM market up to 2024. Significant capacity addition by major industry players has resulted in product oversupply, which may hamper EPDM market price trend. Also, the global synthetic rubber market has been witnessing a change in the demand-supply dynamics. This is likely to further negatively influence industry growth. The market is also influenced by oscillating crude oil prices as raw materials used in manufacturing process are petroleum products, making the final outcome non-biodegradable. However, introduction of bio-based EPDM market products with sugarcane and other bio based raw materials is anticipated to boost growth. Automotive EPDM market size was valued at over USD 1.07 billion in 2015. Apart from steel, aluminum and other synthetic rubbers, it is one of the key raw materials used in automotive component production. It is primarily used in rear lamp gaskets, inner tire tubes, hoses, tire sidewalls, front & rear bumpers, belt drives, braking systems, door seals, and interior panels of cars. The broad application scope in automotive industry is expected to boost growth over the forecast timeframe. Construction applications are projected to expand at over 5% CAGR in terms of revenue. Owing to its extraordinary resistance to heat, cold, sunlight, and air pollution, this polymer has seen an ever increasing demand for roofing purposes which is in turn anticipated to boost EPDM market share further in the construction industry. Moreover, due to its desirable thermal and mechanical characteristics, electrical & electronics applications are forecast to generate revenue of over USD 200 million by 2024. North America, aided by U.S. EDPM market size, was valued at over USD 600 million in 2015. High per capita customers spending along with increasing renovation activities in residential and commercial buildings is likely to boost regional growth. Asia Pacific is anticipated to witness highest gains and grow over 6% annually by 2024. Growing population, has increased infrastructure spending, driving particularly in China and India EPDM market size in the region. Also, growing automotive industry, mainly in Indonesia, will further propel industry growth in future years. Latin America is projected to witness significant gains owing to increasing automotive component manufacturing, particularly in Brazil. Global EPDM market share is highly competitive. Major industry includes Petrochina Co. Ltd., Versalis, Exxonmobil Chemical Company, SK Global Chemical Co. Ltd., and Mitsui Chemicals Inc. Other significant market share contributors are Carlisle Companies Inc., DOW Elastomers, John Manville Inc., JSR Corporation, Kumho Polychem Co. Ltd., Lanxess AG, Lion Copolymer LLC, OAO Nizhnekamskneftekhim, and Sumitomo Chemical Co. Ltd. The industry is witnessing high degree of forward integration. For instance, Lanxess AG, ExxonMobil Chemical Company, Firestone Building Products Company, and Johns Manville are integrated forward to produce EPDM based products from the raw materials manufactured by the same companies. Although there is a lot of captive consumption of raw materials, there is also a boost in raw material markets due to increasing demand. Along with Chinese companies, the degree of competition is anticipated to remain high over the duration of the forecast period. Ethylene Propylene Diene Terpolymer is extremely durable synthetic rubber extensively used in automotive parts, construction purposes (roofing), electrical & electronics, plastics, and lubricant additives. Its primary elements, ethylene and propylene, are derived from oil & natural gas. Also, ethylene constitutes around 40% to 80%. The high ethylene content, offers enhanced loading possibilities of the polymer, extrusion, and better mixing. Furthermore, they offer superior mechanical, thermal, and insulating property which makes them desirable for widespread application. The industry is mainly driven by growing automotive and construction sector particularly. In addition, Asia Pacific was largest regional market in 2015 owing to growing end use industries particularly in China and India.